VietNamNet Bridge – The central province plans to protect a herd of gray-shanked douc langurs (pygathrix cinerea) who have lived in a forest in Nui Thanh for 10 years. A biologist watches a herd of gray-shanked douc langurs (pygathrix cinerea) in a forest in central Viet Nam. Head of Quang Nam Forest Protection sub-department, Phan Tuan told the Viet Nam News that the herd, which was estimated to number around 50 individuals, was found living in a 10ha forest in Dong Co Village of Tam My Tay Commune. Tuan said local residents could see them at close range in a forest near Hon Do Mountain, but their habitat has become endangered due to logging. He said the sub-department had warned local residents of the existence of the langurs and moved to protect the endangered primates. “We advised the local administration and people to help with protecting the langurs, as their habitat is disappearing due to increased logging of acacia – one of the most profitable woods in the central region,” Tuan said. According to Tran Huu Vy, director of the Centre of Biodiversity Conservation, GreenViet, the langurs need special protection at the site as rapid logging damages the habitat of the endangered primates. Vy said the province should call on support from biologists, international organisations and wildlife protection programmes in sharing experience and scientific measures on how to protect the langurs from extinction. He warned that moving the langurs to another area would be harmful, as the primates were used to the stable environment of their current habitat. He said the habitat needs to be isolated from human activities. 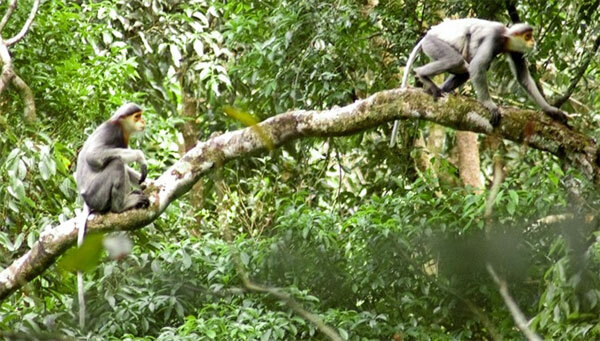 Experts from the Frankfurt Zoological Society’s Viet Nam Primate Conservation Programme said around 1,000 gray-shanked doucs were recorded living in forests of five provinces, including Quang Nam, Quang Ngai, Binh Dinh, Kon Tum and Gia Lai, and Gia Lai’s National Kon Ka Kinh Park preserves the largest number of langurs. Expert Ha Thang Long, head of the representative office of the Frankfurt Zoological Society in Viet Nam, who is an authority on gray-shanked douc studies, said the gray-shanked douc langur is listed on the International Union for Conservation of Nature (IUNC) Red List as one of the world’s 25 Critically Endangered primates. 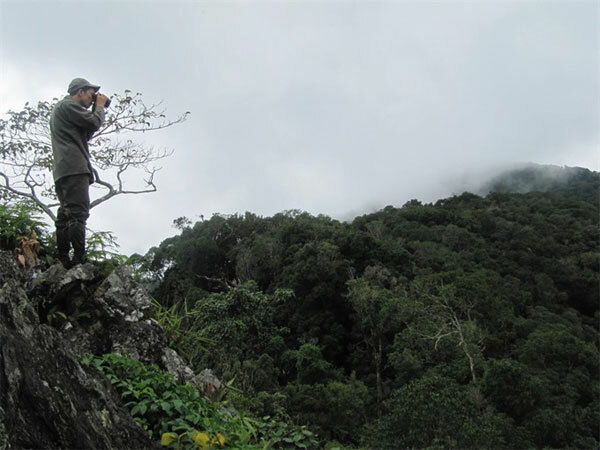 Long said the conservation programme to protect the primate species was launched in Kon Ka Kinh National Park in the Central Highlands province of Gia Lai in 2006. Long said biologists counted 250 langurs living in the park – the largest troop in Viet Nam. Long said the Frankfurt Zoological Society provides funding of between US$18,000 and $25,000 a year to support rangers at eight stations in the park in protection of biodiversity and the langurs since 2010. Illegal logging and hunting is seen as the biggest threat to endangered species in the central region.